Objectives: The objective of this study was to assess the safety and efficacy of intranasal and oral dexmedetomidine for procedural sedation in pediatric dental patients. Materials and Methods: Forty-four uncooperative American Society of Anesthesiologists Grade-I children, requiring dental treatment were randomly divided into four groups who received different doses of dexmedetomidine through intranasal and oral routes. The vital signs were monitored continuously during each visit. Results: In this study, significant (P < 0.05) differences were found in the onset of sedation, duration, and recovery time between intranasal and oral groups. All vital signs were within normal physiological limits with no significant adverse effects in either of the groups. Conclusion: Dexmedetomidine is a safe and effective agent for procedural sedation in pediatric dental patients with intranasal route having distinct advantages over oral route. Fear and pain are the most powerful influences affecting attitude toward use of dental services. However, over the past few decades, the management of anxiety, fear, and pain in pediatric patients undergoing diagnostic and therapeutic procedures has been developed substantially. In recent times,, management of anxiety and unwanted mobility in children during dental treatment has markedly reduced after the introduction of procedural sedation and analgesia (PSA). This has further lead to a decrease in need of general anesthesia in both medical and dental practices. It has well been elucidated through earlier works that PSA can be safely and effectively administered without the help of anesthesiologist outside the operating room and in dental clinics. Moreover, it considerably improves patients' behavior, reduces apprehension, and minimizes negative psychological response toward dental treatment. A variety of drugs and various routes of administration (oral, submucosal, transmucosal, intramuscular, intravenous, rectal, etc.) have been used till date for PSA in dental clinics, each of them having their own pros and cons. Dexmedetomidine is a relatively newer drug, approved by the Food and Drug Administration in 1999, to be used in humans for short-term sedation in the Intensive Care Unit. It is a highly selective α2-agonist which has both sedatives as well as analgesic properties and is devoid of respiratory depressant effect. These properties render it potentially useful as a premedication before anesthesia procedures too. Consequently, this study was aimed to evaluate and compare the safety and efficacy of dexmedetomidine administered through oral and intranasal route for procedural sedation in pediatric dental patients. Forty-four systemically healthy children (American Society of Anesthesiologists Type I) aged between 4 and 9 years, for whom basic behavior modification techniques were unsuccessful in providing dental treatment were considered for the study after gaining approval from the Institutional Ethical Committee of Babu Banarasi Das College of Dental Sciences, Lucknow. Risks and benefits of sedation were explained to the parent/guardian at the initial examination appointment. Both medical as well as dental background of the patient was thoroughly documented and checked along with any history of hypersensitivity with respect to dexmedetomidine. Parents/guardians were requested to fill a written consent form and assent form was obtained from older children before the procedures followed by presedation instructions. A comprehensive preanesthetic assessment was performed by an experienced anesthesiologist and patients were randomly divided into four groups on the basis of route and dose to be used for drug administration i.e. Dexmedetomidine (Trade name: Dextomid, Neon Laboratories, Mumbai, Maharashtra, India). Group 2 – 2.5 μg/kg of body weight. Two groups for oral administration of dexmedetomidine. Group 4 – 5 μg/kg of body weight. At each session of sedation; during the administration of drug, the children were evaluated for behavior response, and after the administration of drug, they were evaluated for onset of sedation, depth of sedation, ease of completion of treatment, recovery from sedation, and any incidence of adverse effects. To obtain assurance of the children's health, they were reevaluated by the anesthesiologist on the day of dental treatment. The vital signs were recorded, body weight was measured and the dose was calibrated accordingly before administration of drug. For intranasal route, half volume of the total required drug was administered into each nostril with the child in semi-recumbent position or in parent's lap using an insulin injection syringe without needle. For oral administration, the drug was mixed with a sweetened mango drink. All the dental procedures were carried out by single operator in the presence of an anesthesiologist. After the onset of sedation, with the help of multi para monitor, the vital signs, that is, pulse rate, blood pressure, and the oxygen saturation were recorded at regular intervals of 10 min. The presence of any side effects or complications was also recorded. 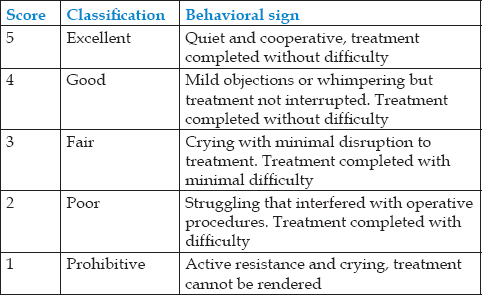 The Ohio State Behavioral Rating Scale as described by Lochary et al., [Table 1] was employed for the patient's acceptance of drug administration. The ease with which treatment could be completed and the level of sedation were measured using separate 5-point scales [Table 2] and [Table 3]. After the completion of the treatment, the patient was transferred to a quiet room for recovery. Once fully recovered, the time required for complete recovery was recorded. The patient was discharged after fulfilling the American Academy of Pediatric Dentistry discharge criteria. The sedation session (treatment outcome) was considered safe and “successful” if: (1) response to treatment score of “2”or “3” (satisfactory) and sedation score of “3” or “4” (adequate sedation) was obtained throughout the treatment, (2) physiological parameters remained within 20% of baselines values, (3) oxygen saturations remained at 90% or greater, (4) physical restraints were not required during the dental procedure, and (5) no major side effects were observed during and after sedation sessions. Various parameters observed and recorded during procedural sedations such as vital signs, oxygen saturation, time of onset, duration, and recovery after administration of dexmedetomidine were statistically evaluated using Mann–Whitney U-test. The effect of dexmedetomidine on the difference in the depth of sedation, response/behavior during treatment, and patient's acceptance of drug administration were analyzed by Chi-squaretest. A two-tailed (α = 2) probability P < 0.05 was considered to be statistically significant. All analyzes were performed on SPSS (version 16.0). Forty-four children were equally divided into four groups, according to routes and doses of dexmedetomidine. The outcome of intranasal dexmedetomidine administration has been summarized in [Table 4]. There was significant difference (P < 0.05) in the duration required for the onset of sedation between the two intranasal groups. In participants of Group 2, the onset of sedation was faster with mean duration of 7 min as compared to participants in Group 1. Similarly, there was significant differences in the duration required for the recovery also. The mean recovery time in Group 2 was found to be significantly (P < 0.05) longer as compared to Group 1. Intranasal dexmedetomidine in Group 2 provided “adequate” depth of sedation during maximum number of sedation sessions (81.81%) and provided “satisfactory” completion of treatment during 9 out of 11 sedation sessions (81.81%). There was no significant difference found in acceptance of drug between the two groups of intranasal route. The overall success rate was more (54.5%) with Group 2 as compared to Group 1. The outcome of oral dexmedetomidine result has been summarized in [Table 5]. Significant difference was found (P < 0.05) in the time required for the onset of sedation between the two oral groups. In participants of Group 4, the onset of sedation was faster with mean duration of 34.45 min as compared to participants of Group 3. There were no significant differences found in the duration required for the recovery. “Adequate” depth of sedation was not achieved in any session neither in Group 3 nor in Group 4. “Satisfactory” completion of treatment was found only in 27% cases of Group 4 and 18% cases of Group 3. No significant difference was found in acceptance of drug in either of Group 3 or 4. The outcome measures of patients in all four groups have been summarized in [Table 6]. The onset of sedation was found to be better through intranasal route than the oral route and the result was statistically significant (P < 0.05). Similarly, there were significant differences (P < 0.05) in the durations required for recovery. The mean recovery time in children sedated with intranasal route was found to be significantly (P < 0.05) longer as compared to children sedated with oral route. Ease of completion of treatment was maximum with Group 2 and minimum with Group 3. Among all four groups, depth of sedation was highest in Group 2. Acceptance of drug was better with oral rather than intranasal route and the result was found to be statistically significant. The overall success rate of procedures carried out after administration of intranasal dexmedetomidine was found to be far superior than oral route and the result was statistically significant. All vital signs were within normal physiological limits with no significant adverse effects in either of groups. Dental fear delays 1 out of 4 children seeking help for a painful dental condition. In some patients, anxiety and fear causes avoidance of oral health-care services. It has also been documented that anxious patients tend to have greater number of decayed and fewer filled-tooth surfaces as compared to their nonanxious counterparts. Children once subjected to painful treatment are persuaded only with difficulty to revisit a dentist even for routine checkup. Thus, it is first and foremost duty of a pediatric dentist to relieve pain and allay anxiety/apprehension of patients visiting a dental office. General anesthesia is a useful solution for the treatment of unmanageable pediatric patients, but its high cost, questionable parental acceptability, and associated complications make general anesthesia the last choice as behavior management tool for providing dental treatment. Other alternative pharmacological technique generally preferred is moderate sedation with use of various drugs. Several routes of drug administration are available, each with their unique advantages and disadvantages. Oral route is most preferred, but child may become aversive due to bitter taste of certain drugs. In addition, slow onset of action, prolong recovery, and high first-pass metabolism are also other disadvantages of the oral route. Hence, in the field of pediatric dental sedation intranasal route has gained popularity and pace in the past few years due to several significant advantages. This route has been used primarily as a means of circumventing the need for injection or bitter tasting oral drugs in children. The nasal mucosa has a rich vascular supply, therefore, immediate absorption of drug takes place directly in the systemic circulation without undergoing first-pass metabolism and resulting in rapid onset of action., Another reason for faster onset can be due to rapid achievement of adequate levels in cerebrospinal fluid through communication with subarachnoid space through the olfactory nerve and its sheath. Dexmedetomidine is an α2 agonist with analgesic and sedative properties. Moreover, it is least likely to produce respiratory depression in comparison with other commonly used sedatives. It is widely used in pediatric patients. Besides other routes, dexmedetomidine is conveniently and effectively given by oral as well as intranasal route and is well tolerated by both., Thus, in this study, dexmedetomidine was compared through intranasal and oral route. In the present study, we used two relatively higher doses of intranasal (i.e., 2 and 2.5 μg/kg) and oral (i.e., 4 and 5 μg/kg) dexmedetomidine to achieve an adequate depth of sedation. Previously, the authors have compared sedation levels in children following administration of two doses of intranasal dexmedetomidine (i.e., 1 μg/kg and 2 μg/kg) and three doses of oral dexmedetomidine (3 μg/kg, 4 μg/kg and 5 μg/kg); but there is a lack of studies which are able to provide a comparable evaluation in terms of better route of administration and even varying doses of dexmedetomidine. The results of this study showed intranasal dexmedetomidine to be a safe and effective agent for procedural sedation in pediatric dental patients with good patient compliance. As a matter of concluding our findings, our study does and will pave a path for future clinicians and researchers to explore not only into the vastness of dexmedetomidine but also for the nasal route of drug administration as a more preferred route for procedural sedation in pediatric dental patients. It was procedurally highlighted during our study that right from the onset of sedation to maintenance of vitals during procedure up till recovery of patients from sedation, dexmedetomidine acts like an almost ideal sedative for procedural sedation. In addition, considering all parameters (onset, duration, ease of treatment, and depth of sedation), the higher dose of intranasal dexmedetomidine was found to be more potent for induction of procedural sedation. Although oral dexmedetomidine with both doses could not produce an adequate depth of sedation as compared to the nasal route, further clinical trials are required to shed some light over its effectiveness through oral route too. Krauss B, editor. Pediatric Procedural Sedation and Analgesia. Philadelphia: Lippincott Williams and Wilkins; 1999. Krauss B, Green SM. Sedation and analgesia for procedures in children. N Engl J Med 2000;342:938-45. Ebert TJ, Hall JE, Barney JA, Uhrich TD, Colinco MD. The effects of increasing plasma concentrations of dexmedetomidine in humans. Anesthesiology 2000;93:382-94. Kaplan RF, Yang CI. Sedation and analgesia in pediatric patients for procedures outside the operating room. Anesthesiol Clin North America 2002;20:181-94, vii. Wang J, Bu G. Influence of intranasal medication on the structure of the nasal mucosa. Chin Med J (Engl) 2002;115:617-9. Abrams R, Morrison JE, Villasenor A, Hencmann D, Da Fonseca M, Mueller W, et al. Safety and effectiveness of intranasal administration of sedative medications (ketamine, midazolam, or sufentanil) for urgent brief pediatric dental procedures. Anesth Prog 1993;40:63-6. Pitetti RD, Singh S, Pierce MC. Safe and efficacious use of procedural sedation and analgesia by nonanesthesiologists in a pediatric emergency department. Arch Pediatr Adolesc Med 2003;157:1090-6. Lochary ME, Wilson S, Griffen AL, Coury DL. Temperament as a predictor of behavior for conscious sedation in dentistry. Pediatr Dent 1993;15:348-52. Padmanabhan MY, Pandey RK, Saksena AK, Chandra G. A comparative evaluation of agents producing analgo-sedation in pediatric dental patients. J Clin Pediatr Dent 2009;34:183-8. Guideline for monitoring and management of pediatric patients during and after sedation for diagnostic and therapeutic procedures. American Academy of Pediatric Dentistry 2016;37:15-6. Boyle CA, Newton T, Milgrom P. Who is referred for sedation for dentistry and why? Br Dent J 2009;206:E12. Allen EM, Girdler NM. Attitudes to conscious sedation in patients attending an emergency dental clinic. Prim Dent Care 2005;12:27-32. Weiner AA, Weinstein P. Dentists' knowledge, attitudes, and assessment practices in relation to fearful dental patients: A pilot study. Gen Dent 1995;43:164-8. Field TS, Cadoret CA, Brown ML, Ford M, Greene SM, Hill D, et al. Surveying physicians: Do components of the “Total design approach” to optimizing survey response rates apply to physicians? Med Care 2002;40:596-605. Jorgensen JL, Reay PA, Ehrich EW, Davis MM. Molecular components of T-cell recognition. Annu Rev Immunol 1992;10:835-73. Lee-Kim SJ, Fadavi S, Punwani I, Koerber A. Nasal versus oral midazolam sedation for pediatric dental patients. J Dent Child (Chic) 2004;71:126-30. Kain ZN, Mayes LC, O'Connor TZ, Cicchetti DV. Preoperative anxiety in children. Predictors and outcomes. Arch Pediatr Adolesc Med 1996;150:1238-45. Arora S, Sinha S, Kosalai K, Namane A, Pym AS, Cole ST. Intranasal atomized dexmedetomidine for sedation during third molar extraction. Int J Oral Maxillofac Surg 2002;3:470-83. Sarkar NN. Mifepristone: Bioavailability, pharmacokinetics and use-effectiveness. Eur J Obstet Gynecol Reprod Biol 2002;101:113-20. Löwhagen P, Johansson BB, Nordborg C. The nasal route of cerebrospinal fluid drainage in man. A light-microscope study. Neuropathol Appl Neurobiol 1994;20:543-50. Cimen ZS, Sivrikaya GU, Kilinc LT, Dobrucali H, Hanci A. Comparison of intranasal and oral dexmedetomidine for premedication in children 10AP2–9. Eur J Anaesthesiol 2010;27:159. Yuen VM, Hui TW, Irwin MG, Yuen MK. A comparison of intranasal dexmedetomidine and oral midazolam for premedication in pediatric anesthesia: A double-blinded randomized controlled trial. Anesth Analg 2008;106:1715-21. Yuen VM, Hui TW, Irwin MG, Yao TJ, Wong GL, Yuen MK, et al. Optimal timing for the administration of intranasal dexmedetomidine for premedication in children. Anaesthesia 2010;65:922-9.